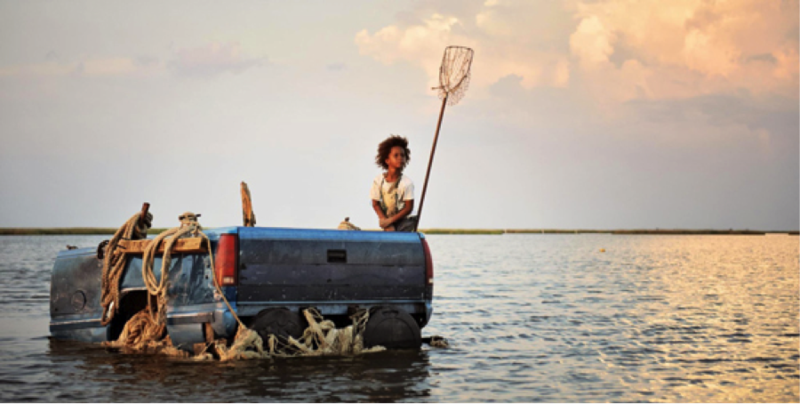 Surrounded by nothing but obstacles, Hushpuppy must fend for herself. When you think of a beast, what do you think of? Well, some people may say that lions and other fearsome animals are beasts. Other people may say that there is a beast in the heart of every single one of us. That's way more deep and intellectual sounding don’t you think? Now, before you boo me off the stage while chucking fruit at my face, I would like to say that those “other people” are not actually wrong. When people are put into desperate situations, their beasts may emerge. Six-year-old Hushpuppy (Quvenzháne Wallis) first caught a glimpse of her father’s, Wink’s (Dwight Henry), beast when he came back from being “missing.” Beasts of the Southern Wild, based on the stage play titled Juicy and Delicious, is all about Hushpuppy’s struggle to stay afloat (pun intended) in a small Louisiana town called the Bathtub. The movie starts off with introducing us to Hushpuppy and the Bathtub. Generally, it looks like a backwater town on a lake that is separated from the rest of the “dry land” by a levee. Wink is a man who prides himself with living in “the prettiest place on earth.” Just by looking at the Bathtub and by looking at other places that most people consider beautiful, we can see that this isn't true. The people in the Bathtub live in broken down shacks and seem to have little regard for self hygiene. That is not what most modern people consider beautiful. Hushpuppy, on the other hand, has no idea that her father is grossly over exaggerating. She has grown up with her father in the Bathtub for her entire life. Her mother even left them when she was just a baby. When Wink tells Hushpuppy about her mother, he just feeds her lies like: “the first time she looked at [you], it made her heart beat so big, that she thought it would blow up. That's why she swam away.” I mean, it is understandable that he wanted to keep his daughter from being hurt. How much would a six-year-old understand about her mother leaving her anyway? Unfortunately, Wink’s motives for keeping Hushpuppy in the dark about her mother do not seem entirely pure. It seems to be easier for him to tell his daughter lies than to face the actual truth himself. He so desperately wants to cling onto Hushpuppy after her mother left, because he would not be able to handle being abandoned twice. What he doesn’t realize is that he is the one that is pushing people away. He refuses to even think about moving out of the Bathtub. Even when a storm is on its way and threatens to change everything that he has ever loved in the world, Wink is still adamant in his refusal. By endangering himself and his child, Wink is forcing them to fight hard for their lives. He is deliberately giving up a better life for him and Hushpuppy in order to believe that the Bathtub is a great place. He wants Hushpuppy to love the Bathtub as much as he does so that she won’t “swim away” from him like her mother did. Like many other people living in the Bathtub, Wink is afraid of what life on the Dry Land will bring. When the storm passes and leaves nothing but destruction in its wake, evacuators from the Dry Land come to help bring the people in the Bathtub to safety. The evacuators are met with angry shouts of, “We ain’t going nowhere!” and “You gonna have to shoot me cause I’m not going.” This is one of the most interesting scenes in the movie because it shows just how afraid of change the people in the Bathtub are. The simple life that they endure every day is better to them than changing the way they live. The Bathtub is like a sanctuary to them, where they live all together in a little bubble without being disturbed by the outside world. Wink has an especially hard time adjusting to life outside the Bathtub. He learns that he has a very serious medical condition, but he does not want to receive help from the doctors who work at the Hospital. He continuously says, “I don't need nothing from you!” as the doctors try to help him. It is not that Wink does not want help. It is more that he is afraid of what will happen to him once he admits to himself and to others that he really is sick. He is afraid of what he and Hushpuppy will become. Wink does not want to lose to the people of the Dry Lands.